In 1993, as U2 were promoting the new album “Zooropa” they had released a first song to the radio, “Numb”. But as that song sounded little like much of U2’s work, a secondary promotional single was distributed to some radio stations, featuring an edit of “Zooropa”. This edit cuts off the long extended introduction, known as “Babel” and gets right to the meat of “Zooropa” starting with the “What do you Want?” questions. On July 24th, 1993 the song charted on the Billboard Album Rock Tracks at #26, and remained on the chart for the next 10 weeks eventually peaking at number 8. It also appeared on Billboard’s Modern Rock Tracks chart on August 7, 1993, and peaked at number 13 during the eight weeks it spent on the chart. This radio play was because of this promotional single being issued in the USA. The promotional single issued in the USA was a 5-inch CD released in a regular jewel case with no inserts of any sort. The CD is silk screened with a green interference pattern, with credits for the track printed over the interference. This pattern was used for a number of CDs in different colours including “Zooropa” (purple), “Numb” promotional CDs (red and orange), “Lemon” promotional CD (yellow), and the “Stay” promotional CD in blue. The CD was also issued in Mexico for promotion, and was released there in a cardboard sleeve. The front cover featured the “Cosmo” figure from the front of the “Zooropa” album, surrounded by stars on a black background. This was similar to the UK sleeve for “Numb” used for promotion, only the stars here are in yellow not white. The back cover of the cardboard sleeve is in full colour, and features the lyrics for the song. 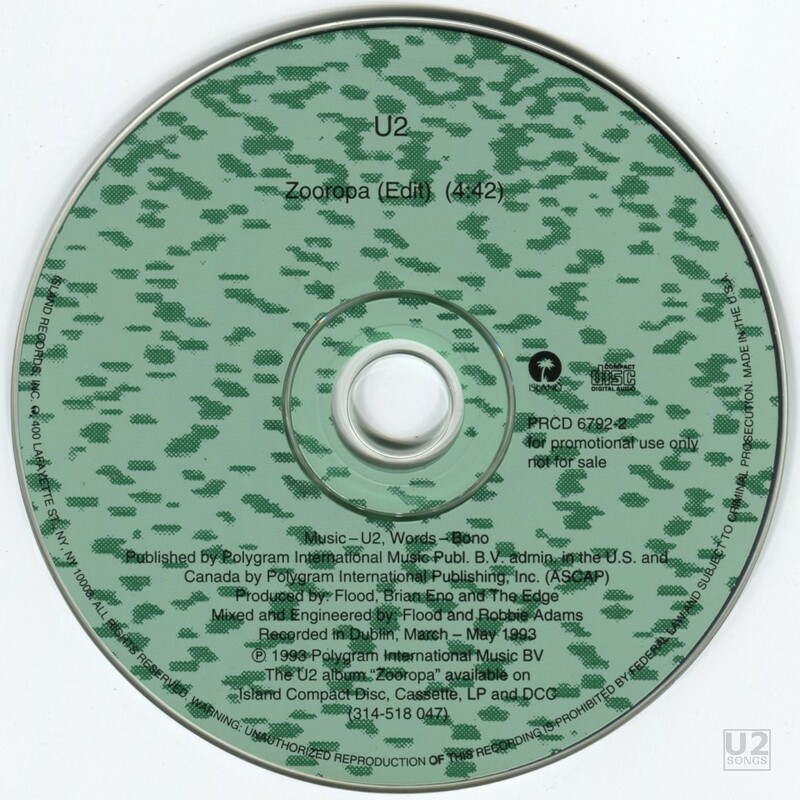 The CD is a 5-inch release, and contains a blue interference pattern, although not in the same layout of text and information as those mentioned above pressed in the US. The Mexican release featured the full length version of “Zooropa” as well as the album version of “Numb”. Music by U2. Words by Bono. Produced by Flood, Brian Eno and The Edge. Mixed and engineered by Flood and Robbie Adams. Recorded in Dublin, March – May 1993. Written by The Edge. Produced by Flood, Brian Eno and The Edge. Mixed and Engineered by Flood and Robbie Adams. Recorded in Dublin, March – May 1993.